This listing is for a wooden baby gym frame and 6 crochet rattling mobiles: the bumble bee, plum, pear, slice of watermelon, apple, peach. Each fruit is hand crocheted from high quality 100% cotton yarn, stuffed with polyester filling and has a rattle inside. Fruits measure from 1.6" (4 cm) to 3,9" (10 cm) in height. 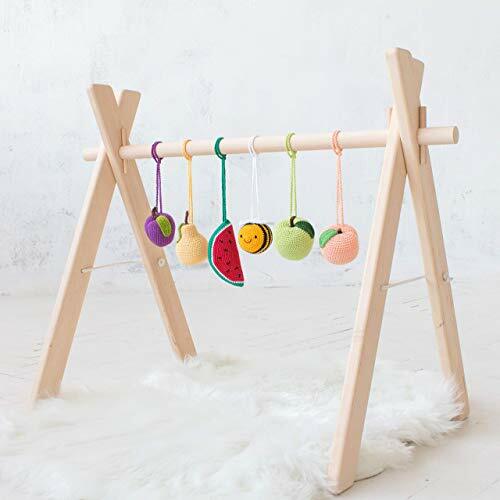 Fruits have 8'' (20 cm) long crochet loops for easy attaching to a play gym bar. ♥ WOODEN, ORGANIC: Made of unfinished alder wood and sanded to be silky smooth. ♥ NON TOXIC: Free of any chemicals and safe for a baby. ♥ STABLE: Has a basic A-frame construction with a fixing rope which ensure STABILITY while a baby is playing. ♥ MOTHER FRIENDLY: No screws are used. Removable construction allows to change toys as often as you need without additional efforts and instruments. ♥ FOLDABLE: Easy to assemble and fold away for storing or transportation. Folds flat when not in use and can be stored under a crib or in a closet. Due to a nature of wood slight variations may occur from the pictures shown. If you have any questions about this product by LanaCrocheting, contact us by completing and submitting the form below. If you are looking for a specif part number, please include it with your message.